Here’s a man whose name has graced these pages several times before. He is the long-serving former Catholic Archbishop of Brisbane Sir James Duhig. Duhig was a priest for almost seventy years and archbishop for nearly sixty. His biographer, Catholic scholar and historian Father TP Boland, says that his “kindness and gentleness, his fondness for children, and his compassion were well known”. Duhig was a grand communicator, both orally and in writing, and an indefatigable traveller throughout his religious life. He mixed just as easily with royalty as with the common parishioner, and his commitment to education in Queensland was exemplary. But it is not these admirable qualities for which James Duhig is most remembered. 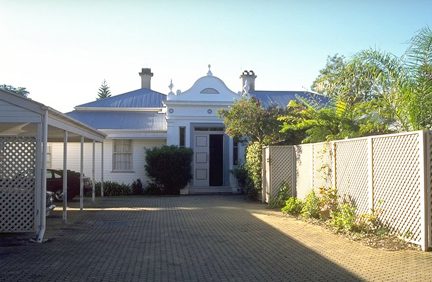 He had a significant impact on the architecture and the development of Brisbane as a city. 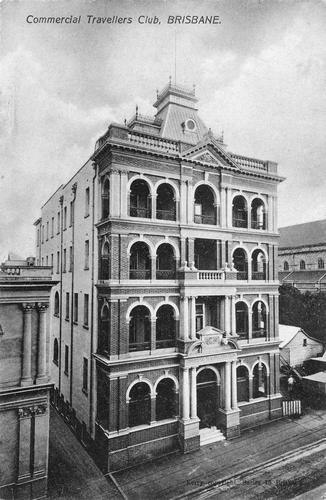 His attraction to property and his ambition to increase the reach of his church saw him responsible for the construction of over 400 buildings in Brisbane, including hospitals, schools and churches. He became known as “James the builder”, and this is the story of the project that was at once his fondest dream, but also his greatest failure. By the time he reached the position of Brisbane’s archbishop, his church was moribund due to the declining health of his predecessor Robert Dunne. 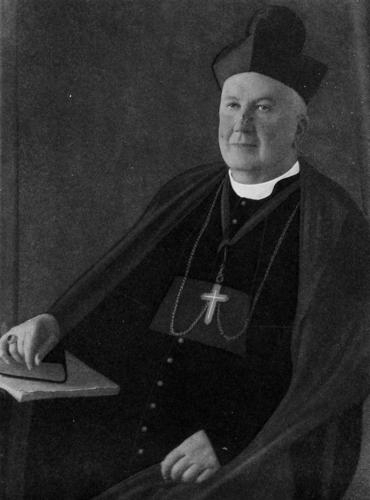 There was no retirement for an archbishop then – his duties ended only at death. Dunne’s final years dragged on, and the business of the Catholic church suffered through lack of action. Once on the throne, Duhig’s remarkable energy sparked an immediate upswing in activity. 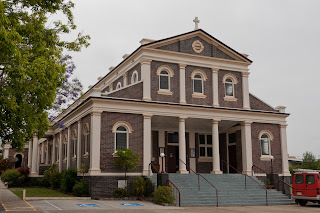 Even as he commenced building churches and schools, James Duhig wanted to replace the venerable Cathedral of St Stephen with a more elaborate and striking cathedral to signify the importance of the Catholic faith in Brisbane. Archbishop Duhig’s home was the opulent Dara, situated on Ann St opposite All Hallows’ school, an area known then as Duncan's Hill. The original Dara was built in 1850, but after being purchased by the church for use as the archbishop’s residence, a new Dara was constructed in 1891. 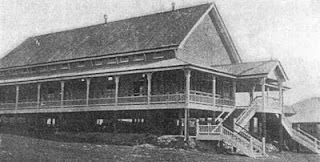 Duhig’s ambition to erect a grand cathedral was so powerful that he demolished Dara in 1928 and moved to Wynberg at New Farm, his residence for the rest of his life and still the home of the Catholic archbishop. His intention was to erect the Cathedral of the Holy Name on the site formerly occupied by Dara. Pictured below are the first Dara (bottom image) and Duhig's Dara (top). But the rapid expansion in the church had come at a cost. The proposed cathedral was out of reach financially. Already heavily in debt to the banks as a result of his building programme, Duhig needed to find another way to fund the cathedral project. He thought he found it in, of all places, western Queensland. "If we find oil, I shall never again have any worries about Church financing, for it will mean finding not thousands but millions. It would be a great Godsend to me, because I have had my share of worries, trying to provide Churches and Schools in the Diocese in which practically nothing was done for twenty-five years before I cane to it... I am praying hard that God may prosper us, because it will mean so much to our education, our charities and other works,"
Needless to say, the oil was a fizzer, not a gusher, but it doesn’t seem to have dampened Duhig’s willingness to speculate – later, interests in gold mining emerged, and even Queensland’s Golden Casket lottery scheme was a wishful source of funds. Despite the lack of proper funding, Archbishop Duhig could not let go of his dream. He engaged his favoured architects, Hennessy and Hennessy, to prepare drawings for an immense cathedral, larger even than St Mary’s in Sydney, using Benedict stone for the exterior. The partnership between archbishop and architect that was so close and mutually beneficial in its early days was to end in acrimony and court action later. The Benedict stone venture, which included a factory and payment of licence fees to the US parent company, also had a negative impact on Duhig's finances. 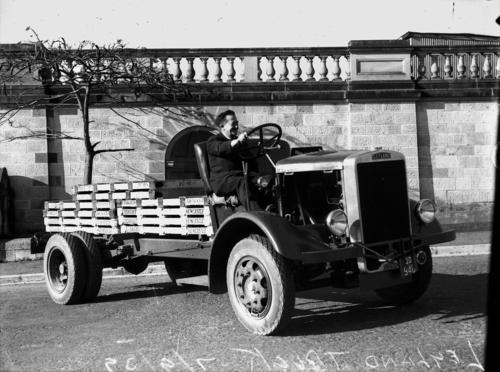 On Sunday 16th November 1928, foundation stones for the cathedral were laid on site. 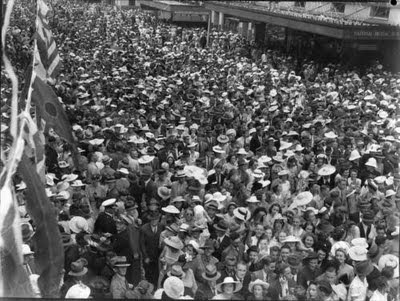 A crowd of more than thirty-five thousand people turned up to see Duhig and other church and local dignitaries proclaim the commencement of construction. The photograph below shows the crowd gathered at Centenary Place, next to the cathedral site. The buildings in the centre background are part of All Hallows’ school. 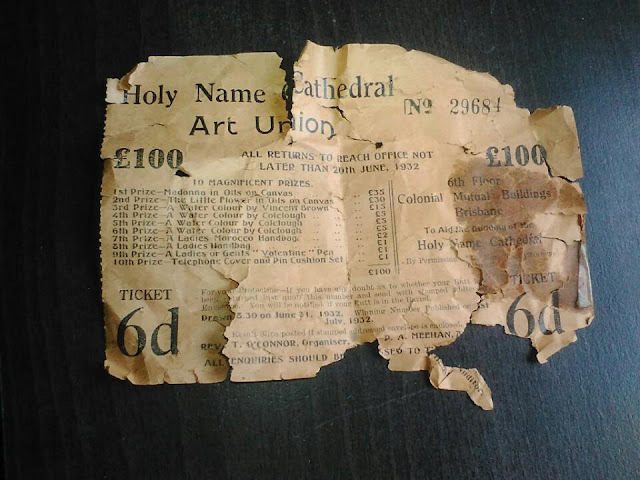 Duhig, increasingly desperate to build the cathedral but low on capital, tried to raise money from Catholic congregations across the state, but those funds were never going to be enough. Here is a photograph of an Art Union ticket from 1932, where the proceeds were to be directed towards the construction of the cathedral. According to Boland, Duhig contemplated selling land around St Stephen's and even the Pugin Chapel from the 1850s was on his "for sale" list. Fortunately there were no buyers. To provide stability for the foundations, the proposed new cathedral site was levelled and a retaining wall was built around the property. It was constructed by the Brisbane City Council in return for a portion of the site that was given to the council to facilitate the widening of Ann St. Here is a photograph of a portion of the wall behind a vehicle of the day. 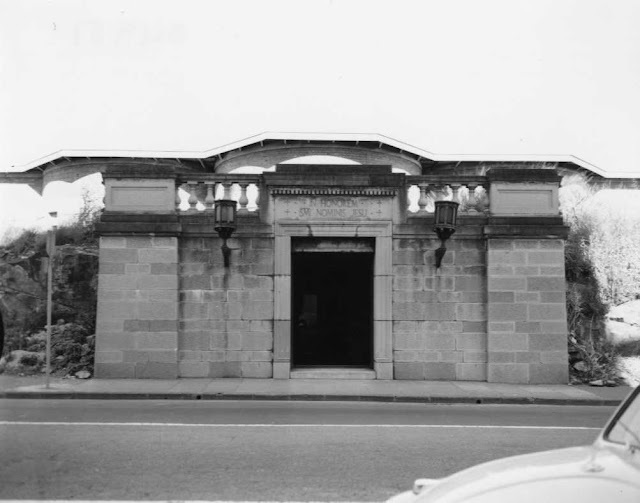 Duhig was able to find enough money to complete the crypt by 1935. I remember passing it in the fifties as a child, thinking that it must be full of coffins and skeletons. Then came the Depression, and following that, World War II. If the project was still alive at the start of the Depression, these two events certainly saw an end to it. Archbishop James Duhig died at Wynberg in 1965, and the crypt and the retaining walls were then only tangible symbols of the cathedral that never was. The site was sold to developers in 1992, and the crypt was demolished to allow for the construction of a residential building - an apartment block called "Cathedral Place". Today, St Stephen's is still the cathedral, and the only the retaining walls in Ann St and Gotha St remain to remind Brisbane’s population of James Duhig’s impossible dream. Above is a current photograph taken from Centenary Park, looking across Gotha St towards the site where the cathedral was to be built. The council-built retaining wall can be seen underneath the apartments, with All Hallows at the right rear of the image. COMPLIMENTS OF THE SEASON. THAT'S OUR FINAL POST FOR 2011. Something is missing in life these days. Jokes! Time was when if a group of mates got together, someone would come up with a line like "Did you hear the one about the commercial traveller?" These days humour seems (to me anyway) based on cynicism and sarcasm, not the yarns that used to be rolled out. I'm not really complaining, just noting it as a point of interest. Well, did you hear about the Commercial Travellers Association of Queensland? (No joke here either, sadly!) 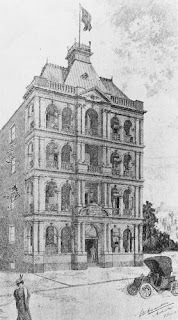 The Association was formed in 1884, and after a period of meeting in hotels they decided to obtain their own premises. With that end in mind, land was purchased in Elizabeth St around 1905. Claude Chambers was engaged, and this is a drawing of the proposed building that was opened in 1907. The building was designed with a dining room and bar on the ground floor, and bedrooms for members to stay in when required. Here is a photograph of the building taken shortly after completion. The CTA was a very progressive organisation, it would seem. A few years after the erection of this building, they built next door a "samples room" building (now demolished), where members could lay out their wares for inspection by prospective buyers. The Association also provided insurance products, savings plans and scholarships for members and their families. As the nature of business changed after WWII, the CTA sold their building to the commonwealth government in 1963. What was then the Post-Master General's department, now Telstra, took occupancy of the building which was renamed Telecommunications House. Here it is today. These days the building houses a number of offices. One of the advantages of a Queen St frontage is that many of the city's ceremonial pieces take place right outside. So it is with today's building, the former National Mutual building. It is situated near the GPO and next to the former CML building, both of which we have already seen in these pages. In the first photo from yesteryear, a large crowd is crammed into Queen St to watch an American fleet march in 1941 - the awning of the National Mutual building is in the background. And an earlier photograph from the Brisbane Courier of 1933 shows the busy Queen St traffic of the day - the National Mutual building is the one with the second awning from the bottom. The land on which the building stands was purchased by National Mutual in 1883, and on it they built their first Queensland headquarters. That building was demolished to allow for the construction of the new seven-storey offices in 1926. The architects were Gibbs, Finlay and Morsby and the builder J Green. 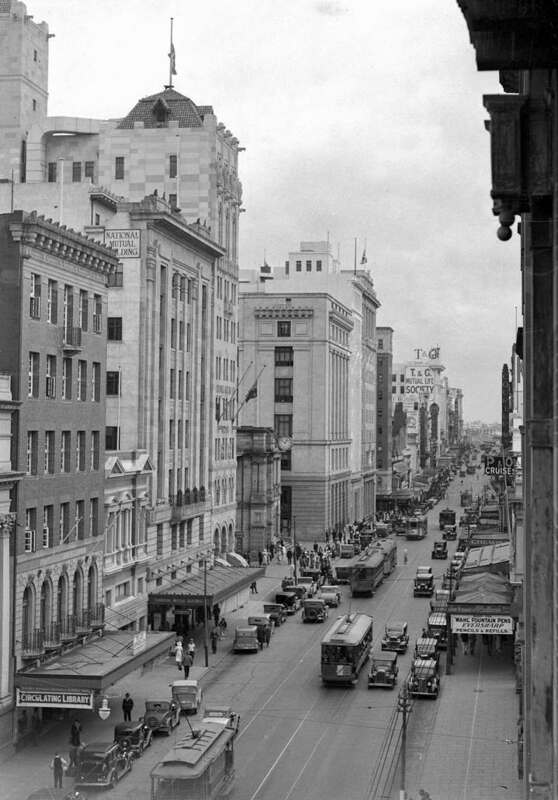 National Mutual occupied the building until 1981, when they moved to a new tower built in Edward St during the height of the battle between National Mutual and AMP for dominance of the Australian life insurance market. National Mutual subsequently demutualised and was picked up by Axa from Europe, but they have recently sold out to, ironically, AMP. This building became the office of Custom Credit, but more recently was bought by Queensland based mega-sized bancassurance company Suncorp. A hundred years can sound like a short time or a long time, depending on your perspective. In looking at the achievements of mankind, a lot has been accomplished during the last one hundred years, especially in the field of medicine. A quick look at the Australian Bureau of Statistics tells me that in the year 1900 infant deaths in Australia were at the rate of 103 per 1,000 live births. By the year 2000, that rate had been reduced to a remarkable 5 deaths per 1,000. As at 2010 the figure stands at 4.9 deaths, and we have no reason to think that it will stop there, particularly if we pay more attention to indigenous communities. One could hazard a guess at the reasons, and I am sure that many of the thoughts that come into our minds would be quite accurate. But what about the pioneers? The actual people on the ground who made a difference in those early days. We had a couple here in Brisbane - Dr Alfred Turner, the first resident doctor of the Royal Children's Hospital in 1908 was one. He saw 100 children a week free of charge and was instrumental in developing a diptheria antitoxin. 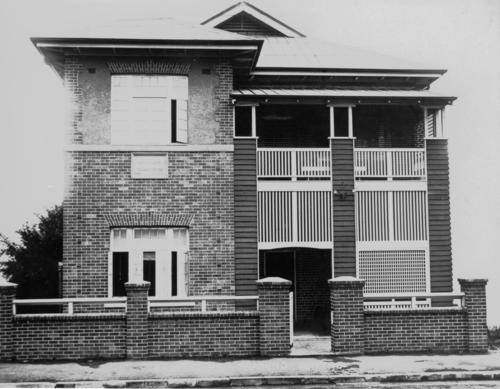 Matron Florence Chatfield, who opened Queensland's first baby clinic in rented premises in Fortitude Valley in 1918, was another. 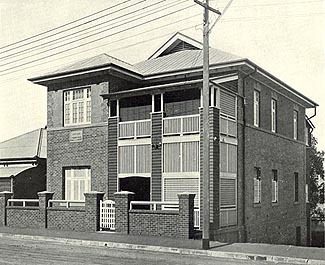 Those humble beginnings were the forerunner of today's building, the Fortitude Valley Child Health Centre, which opened in 1923 with Chatfield in charge. A couple of early photographs of the building follow. Funds from the Golden Casket were diverted to allow the construction of this first clinic in 1923; this significant deal having been brokered by Charles Chuter from the Home Secretary's Department. 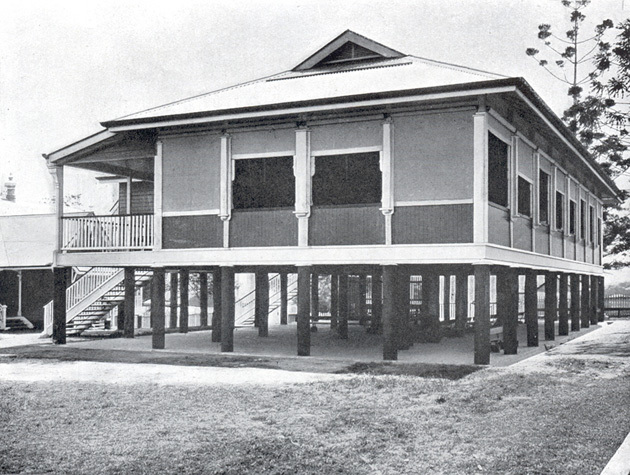 Land was bought from businessman TC Beirne, and Cecil J Virgo from the Department of Public Works designed the practical building. 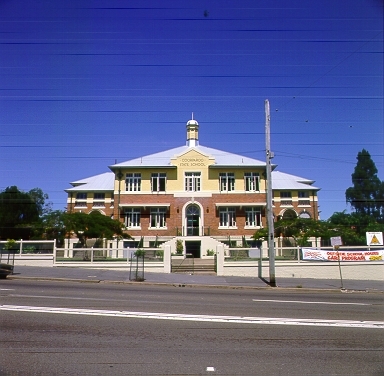 Virgo, amongst other buildings, was also the designer of Coorparoo State School. As can be seen from the following current photographs, the building was later enlarged with the addition of an extension on the RHS, skilfully blended into the rest of the design. Unfortunately the first floor balcony has been closed in, probably to allow for the installation of air conditioning. 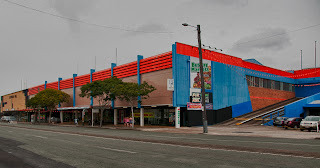 Although other Queensland Health Services have now been located here, a Child Health Centre continues to occupy most of the ground floor. In the early days of Brisbane there was quite an influx of Scottish tradesmen, principally as a result of the influence of Dr JD Lang. SS Fortitude brought Scottish immigrants to Moreton Bay in 1849, and many more followed. Twenty year-old John Grant, a stone mason, arrived on board the William Miles in 1855. Also on that voyage was the McPherson family, and Grant was destined to marry Jane McPherson, the oldest daughter. 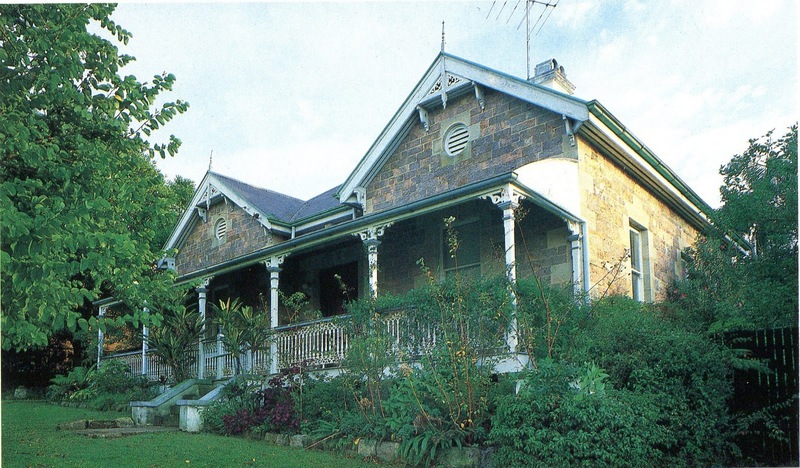 The McPhersons initially worked on the McConnel family's Cressbrook station in the Brisbane Valley, but later returned to buy their own property at Bald Hills. After marrying at Ipswich in 1859, it appears that John and Jane Grant were diligent and therefore prospered. John and Jane had nine children, although one of their sons died at the age of two. In the late 1880s they bought land at Windsor, and around 1890 John constructed the family home there. He built it from Brisbane tuff, probably excavated just up the road from his house at the Windsor quarry. The house was called "Craigellachie" after the Scottish town in the middle of the whisky belt. 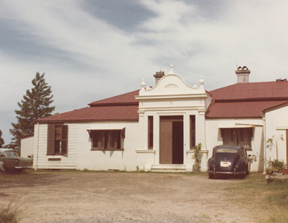 Clan Grant has the battle cry "Stand fast Craigellachie", so the name of the house obviously had significance for Brisbane's Grant family. Not all the Scots turned out to be upstanding citizens of the new colony. Jane Grant's brother, James Alpin McPherson, spent his initial years here at school, then as an apprentice in the well-known Petrie family's construction business. In 1864 he left his apprenticeship and turned to life as a bushranger. Known colloquially as "The Wild Scotchman", James McPherson robbed mail coaches, hotels and cattle stations throughout Queensland until he was captured and imprisoned in 1866. James McPherson was released from the prison on St Helena Island in 1874. He married in 1878 and by 1890 he and his own family were living in Burketown, Far North Queensland, so it is doubtful that he ever visited the home of his sister and John Grant. 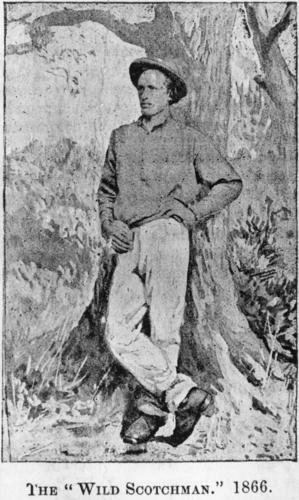 James McPherson was killed in Burketown as a result of a riding accident in 1895. It is claimed that some of McPherson's exploits were woven into the novel "Robbery Under Arms". Craigellachie remained in the Grant family until 1974. At some stage it was converted into flats, but a renovation in the mid-seventies saw it restored to a family home again. This is the way it looks now. James Gibbon, a property speculator in Brisbane's early days, was responsible for the name of the suburb where I live - Teneriffe. Gibbon was a parliamentarian referred to as "Streetcorner Jimmy" because in his non-political life he had a penchant for buying up prime real estate around the traps. In 1854, he bought a fairly large parcel of land between New Farm and Newstead and on it built his own residence that he named Teneriffe, apparently after Tenerife in the Canary Islands. The house was designed by WH Ellerker and built in 1865 for the sum of £1715. It is perched on a hill overlooking the Bulimba reach of the Brisbane River, and when he lived there (between 1865 and 1882), Streetcorner Jimmy would have been master of all he surveyed. The house gave its name to the hill upon which it was constructed and then to the suburb that grew around it once Gibbon's land was subdivided. The suburb has metamorphosed through farming, commercial and residential phases since then. It even lost its identity for a while, as the powers that be in place-name head office decided that it would cease being a suburb. The name Teneriffe stuck around as a locality (a locality is what they call it when the residents refuse to stop using the name of a defunct suburb!) for a while until, as a result of community pressure, it was reinstated to its former exalted status. This allows those of us who live here to have a party every year to commemorate the Ascension of Teneriffe. 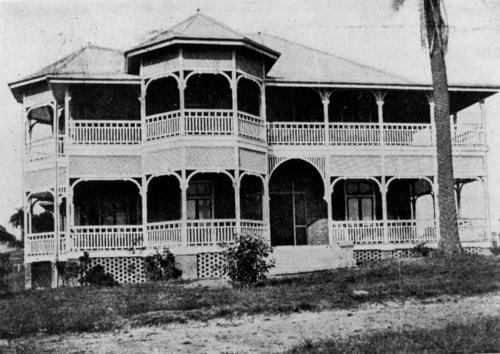 Gibbon's house was sold to businessman Robert Wilson in 1882, and sub-division of the extensive surrounding land occurred around this time. 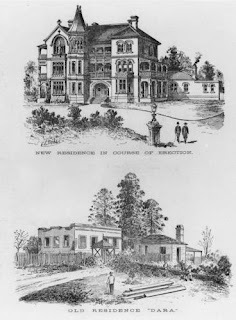 Wilson also undertook some renovations, including the addition of another wing and a billiard room. Further alterations took place later, including the resumption of a tract of the property's former orchard by the Brisbane City Council, who then turned it into leafy Teneriffe Park. The park still borders the house, and it's a lovely cool walk through there down to the river. The house was converted into flats in the late 60s, and still is in that form today. Streetcorner Jimmy lives on in local street names too. There should be a memorial to him on the corner of James St and Gibbon St - but there isn't. I never really thought of myself as over-industrious, but now as I think back, I must have had a reasonable amount of get up and go. I worked in the local corner store after school for some years, then during one school holidays at Christmas I built trains at Rocklea. Then in my last holidays after finishing secondary school, I picked up a job working in the groceries section of Myers at Coorparoo. 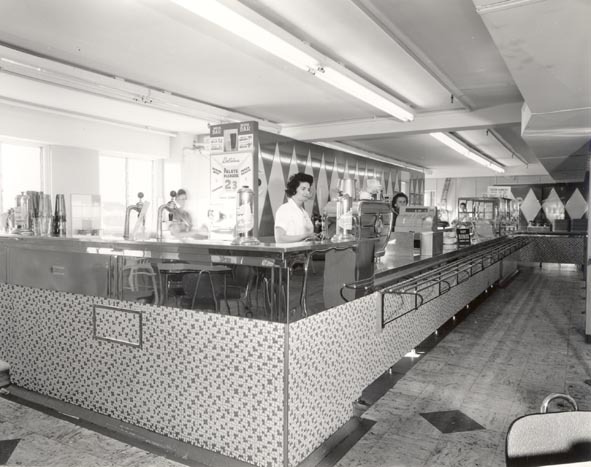 The shopping centre was opened in 1960 by premier of the day Frank Nicklin, whose father and grandfather had lived nearby in the early days of the suburb. I worked there in 1966, and this is the way it used to look. Right behind the grocery section on the ground floor was the cafeteria. Staff were allowed to have lunch there (of course we had to pay, but we did get a discount). This is just how I remember it. When I rocked up to my first day's work, I found that one of my new workmates was the son of my high school headmaster. We became quite friendly - I think he had a bit more regard for me than his old man did! Since those days, the centre has gone through many changes. 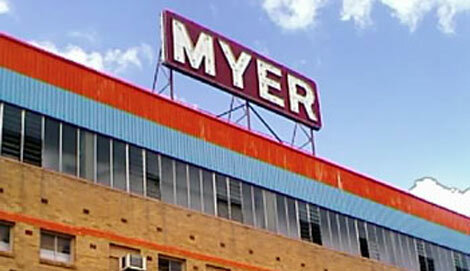 Myer converted their department store into a Megamart that sold furniture and electrical goods. That tanked and it was taken over and rebadged by Harvey Norman. That store also failed, and the building was shut down around 2007. 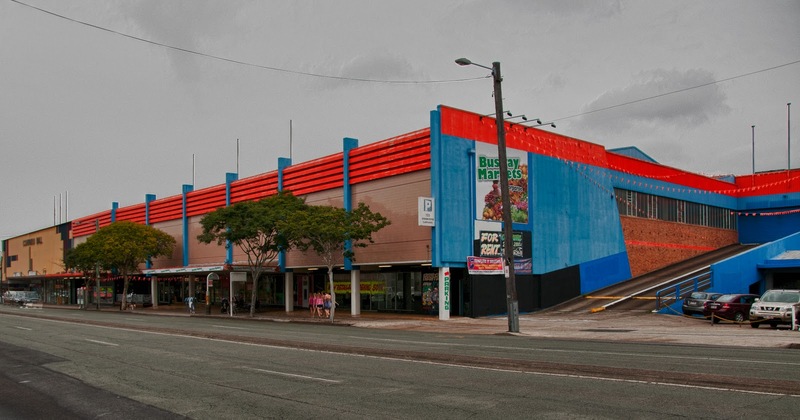 Recently it was given a new lease of life by some entrepreneurs who renamed it Myermarkets Coorparoo. Tenants were largely food and vegetable vendors. However, I understand that the site has been purchased by Brisbane City Council who are busy constructing the Eastern Busway. Perhaps a park-and-ride facility is in the future, I'm not sure. This is the way it is looking at present. 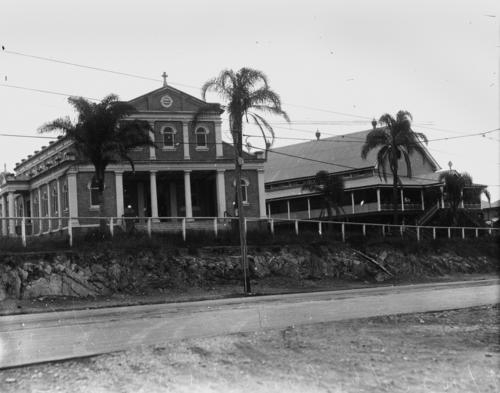 The first white settlers arrived in the Coorparoo area around 1856. The suburb wasn't known as Coorparoo then, it was part of Bulimba. The first school was built some twenty years after that - it was, according to the school's web pages, a one-room building with hardwood floors and a shingle roof. 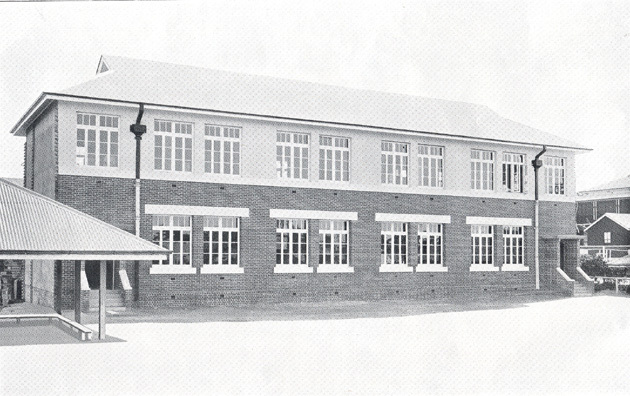 The school opened in January 1876, and by the end of the year it had over 100 pupils. Among the early students was George Nicklin, the father of long-serving state premier Sir Frank Nicklin. 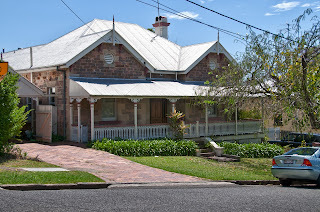 George Nicklin probably had to walk from the family home Langlands (now part of Villanova College), but his parents later moved to Hatherton, just next door to the school. 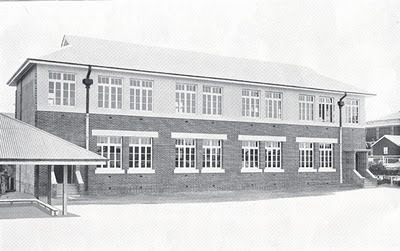 The following photograph shows the little school in 1916. The name of the suburb is surrounded by some confusion. 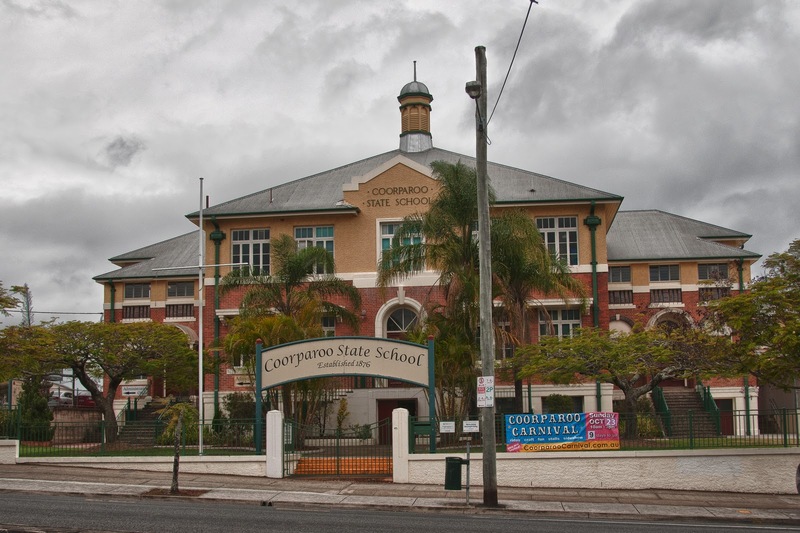 The school takes credit for the name Coorparoo, saying that it was bestowed on the school by the first headmaster. They say the suburb was named after the school. Others say that the name comes from an aboriginal word that could mean either "place of the mosquito" or the name they used for the area surrounding Norman Creek. If the latter, it could be onomatopoeic for the sound made by the doves that inhabited the place. Whatever, it is one of those delightful indigenous words that rolls off the tongue if you are a local, but completely baffles anyone else. 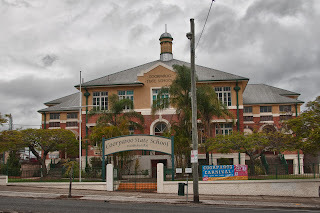 As the suburb grew, so did the school. During the depression era when public works were in full swing, the original timber school house was demolished to make way for a new brick school designed by Cecil J Virgo. A two-storey building was constructed, and it is shown from the rear (above) and from the front (below). Of course, the school has continued to grow since then, with its peak year for enrolments being 1958 when it was flooded by baby-boomers, having a student population of around 1600. Today's picture of the school is above. The area is now a solid middle-class suburb quite close to the city. This fabulous school building definitely gives the local environment some class. This is one of the first buildings that I can remember looking at and thinking "Now that is impressive!" I was only a kid, and I used to pass this church on the way to visit relatives. I knew it was a church, but that wasn't why I thought it impressive. It was the scale of the thing - the sheer size of it that captured my attention. This photograph is from 1932.
Who else but Archbishop James Duhig would have been the prime mover behind the construction of this church? In fact he presided over the opening of two churches on this site - the first was a combination church and school that opened in 1913, shown below. Then the current church that was inaugurated in 1928. This is the way it looks today. After the completion of the original church, a presbytery was also constructed on the eastern side of the same property. Here is a picture of it from 1915. 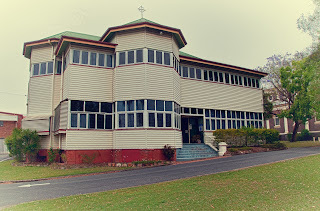 The parish was taken over by the Augustinians in 1952, and in 1958 the presbytery became a priory of the Augustinian community. The building was renovated to provide more room for the priests - look at what they did to it! The Augustinians are involved in two schools within the parish. There is St James's Primary School behind the church, and the well-known Villanova College a short walk away.